If you're looking for a recipe for chocolate truffle cake, then you've come to the right place. This dense and decadent, flourless cake is loaded with the perfect flavor combination of chocolate and raspberry. Why not give your family a real treat and whip up this chocolate truffle cake today? This recipe for chocolate truffle cake relies on butter, eggs and chocolate for its structure rather than flour. The result is a dense, fudgey cake that can be served alone or topped with raspberry sauce and whipped cream. The cake needs to be chilled overnight, so plan on baking it the day before you wish to serve it. Prepare your pans and preheat your oven to 350 F (325 F for convection). Butter parchment paper on both sides and use it to line an eight inch by 2 1/2-inch spring form pan. Make sure the parchment comes at least 3/4 of the way up the sides of the pan and seal it to the pan using one of the buttered sides. Once your pans are prepared and the oven is on, you can begin to make the cake. Heat the butter, sugar and milk in a saucepan. Remove the pan from heat when the butter is melted and whisk in the chocolate, stirring until it is completely melted. Set the chocolate mixture aside. Place the eggs and egg yolks into a bowl and whisk vigorously until well combined. Slowly whisk the eggs and egg yolks into the chocolate mixture until it is completely combined once the chocolate mixture has cooled slightly, . Bake the cake for 50 to 60 minutes in a convection oven or 70 to 90 minutes in a conventional oven. You will know the cake is done when the sides are puffy and cracked and the center is still slightly soupy. Refrigerate the cake in the springform pan overnight. The center will set and harden as the cake chills. Separate the cake from the springform pan by running a knife around the edge after the cake has chilled overnight. Release the springform and carefully remove the parchment from the edges of the cake. Serve the cake chilled with raspberry sauce. This raspberry sauce makes the perfect accompaniment to chocolate desserts. Use fresh raspberries, which impart the best taste. Combine the raspberries, sugar and orange liqueur in a saucepan. Combine the cornstarch and water and whisk until it is well combined. Add it to the saucepan. Bring the berry mixture to a boil and then simmer for approximately 5 minutes until it begins to thicken and coats the back of a spoon. Remove the sauce from the heat and allow it to cool slightly. Purée the sauce in a blender, or use an immersion blender. If you are using a blender and warm sauce, be sure to hold onto the lid with a towel to protect your hand, and lift the lid to allow the steam to escape once or twice during puréeing. Strain the sauce through a fine mesh sieve. Chill the sauce and then serve with truffle cake. Can't get enough chocolate? 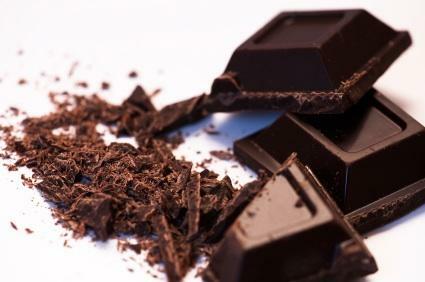 Try these chocolate delicacies!